Our guide to playing the Rise of Shadows Midrange Hunter in Season 61. 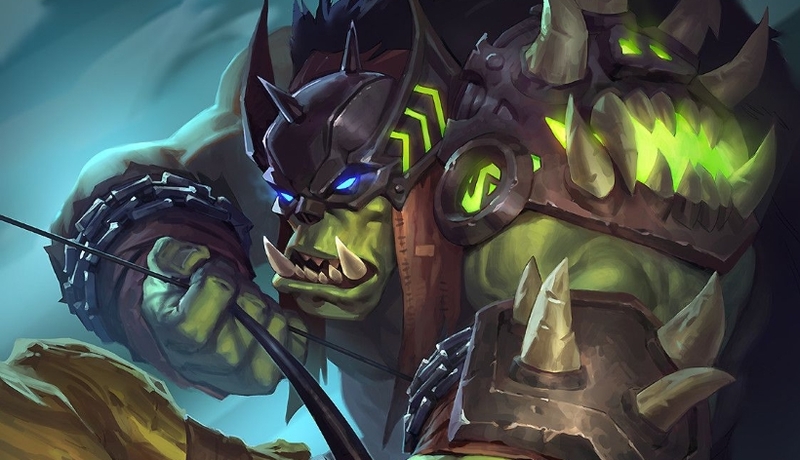 Our Midrange Hunter deck list guide features the best Rise of Shadows deck list for Hearthstone (April 2019). Our Midrange Hunter guide also contains Mulligan advice, card combos and strategy tips. Midrange Hunter is a Hearthstone deck that's been a popular choice in the game since time immemorial. Not only can it take a controlling position against more aggressive opponents, but it can also can quickly switch to a more aggressive stance of its own when you need to finish a game against slower opponents who threaten to starve you of cards. Suffice to say, a broad understanding of the state of the current metagame will go a long way when it comes to winning more games with this archetype. The latest version of Midrange Hunter includes a handful of new cards from the Rise of Shadows set that slot into the list with ease by building upon the natural Beast synergies within the deck to great effect. Do have a browse below at some of our in-depth strategy advice, as some pointers on how to Mulligan correctly in a fresh meta. Finally, we run through all of the most important card combos that exist in this version, before highlighting the core cards along with substitute advice. Select and copy the long ID string below, then create a deck in Hearthstone to export this deck into your game. Taking advantage of beast synergy, weapons and minion buffs the Midrange Hunter aims to steadily build pressure over the game with a well-curved deck full of value-oriented cards. You should be able to find a strong play on each turn to build a powerful board, whittle down your opponent over time, and finish them off with big late game minions or burst damage from Kill Command. Early game: Play out your early game minions and take efficient trades where possible. Many of these will generate additional cards in your hand so your can keep the pressure on at every turn or find something to fill the gaps in your Mana. Headhunter's Hatchet is an excellent removal tool against enemy minions so try to play it when you have a Beast on the board to get that extra point of Durability. Mid game: Continue applying the pressure with strong on-curve plays. With a board established you can go directly to the face against an unthreatening board to see about a quick win. Weave in your hero power if you have any spare mana to do so. If you’re falling behind and have to take some trades, you can always refill your hand with Master's Call to draw three Beasts, or Unleash the Beast can usually take out at least one of your opponent’s minions and survive. If you have a particularly good target for it, now is the time to play Dire Frenzy on one of your best Beasts. Late game: Savannah Highmane is a huge late game threat that requires some careful removal for your opponent to deal with it fully. What you’re really looking for, though, is a way to finally burst your foe down with Kill Command or some Beasts with Charge. Zul'jin is also in the deck as a throw of the dice to seal the win as the value from replaying all your spells can be huge. Save up to 40% on your Hearthstone card packs with Amazon Coins. You get cheaper cards while also supporting the continued development of Metabomb. Our Amazon Coins guide has more detail. 1. Play control in the early game using weapons and Rush minions to keep their side of the board empty. 2. Once they’re on the backfoot you can become the aggressor, ignoring their minions and going directly for their life total. 3. If you can set up a big play with Scavenging Hyena and Unleash the Hounds to counter their wide board you’ll be left with a giant minion that they may struggle to deal with easily. 4. Try to save Kill Command for some final burst damage, but you can use it to clear a minion if you’re desperate. 1. Play more aggressively from the start and look for opportunities for extra damage with your hero power wherever you can. 2. If they’re missing the hard removal to deal with some of your late game cards then you can push through more damage and go for the win. 3. Save together all your burst damage for a single turn rather than chipping away at them every so often. Control decks can often heal or generate Armor to negate all your work and it’s best left to surprise them with all in one go. 4. As the deck features no hard removal you’ll have to find ways to punch through big minions or hope you get lucky with a random spell generation effect. 1. Shimmerfly: A very basic one-drop, but it comes with the added bonus of granting you a random Hunter spell. 2. Springpaw: Another straightforward early game minion that also refills your hand so you can keep the pressure up on the next turn. 3. Hench-Clan Hogsteed: The Rush effect means you can respond to your opponent’s early drops quicker while still leaving something on the board after it dies. 4. Animal Companion: Perfectly solid minion generator, though you have to roll the dice a bit to hope you get the ideal result. 5. Headhunter's Hatchet: There’s a good chance you’ll have a Beast on the board when this is played to gain the extra durability, and it’s perfect for attacking early game minions. With an influx of new cards comes a whole new load of synergies to think about. Midrange Hunter may be a bit of an old dog at this point, but it's certainly picked up a few new tricks with the latest expansion. Here's a quick look at some of the most crucial combos - old and new - that you need to keep in mind as you play through every game. - Scavenging Hyena gains an extra +2 / +1 of stats whenever a friendly Beast minion dies. You can boost this character up quite quickly using Unleash the Hounds, for example. - Try to play Headhunter's Hatchet after you already have a beast on the board as it’ll gain 1 extra Durability. - If you equip Headhunter's Hatchet while you have a Beast on the board it’ll gain one extra Durability, making it an extremely valuable weapon in the early game. - Kill Command only does three points of damage as standard, but if you've got a Beast out in play that damage value increases to five. - Master's Call offers some serious card draw to Midrange Hunter. As all of the minions you run in the deck are Beasts, that means you’ll always add three cards to your hand for just three Mana. - Most opponents will look to kill Tundra Rhino as soon as it comes into play as giving your Beast minions Charge can be massive. Remember, the Charge effect also applies to Tundra Rhino too! - When you play Zul'jin he’ll cast every spell you’ve used throughout the match once again, including the likes of Kill Command and Unleash the Beast. It can make for a ridiculously powerful turn but be warned as the targets are completely random and you could end up hurting yourself more. Shimmerfly: A nice minion to get you on the board early that also comes with the benefit of generating a bonus Hunter spell for you. Dire Wolf Alpha: Can buff the Attack power of some of your weaker early game minions so that they trade up into your opponent’s drops. Headhunter's Hatchet: An excellent weapon in this deck that steals the spot usually reserved for Eaglehorn Bow due to all the Beast synergy. Scavenging Hyena: With all the Beast minions you run in the deck there’s a good chance you can make this into a rather giant threat in the right board state. Animal Companion: Misha, Leokk and Huffer are all useful in different situations. It’s not a disaster if you don’t get the one you need, but when you do it’s glorious. Master's Call: Gives the deck a powerful way to stay in the game if you’re running low on resources by drawing three more Beast creatures. Kill Command: A big burst finisher and with the way this deck is stacked with beast minions you should always have a way to activate it. Dire Frenzy: Target your best Beast minions with this so you have some more late game reach to dig for in your deck. Unleash the Beast: Generates a big minion for you and because it's a Twinspell you can do it again the very next turn. Savannah Highmane: Your big late game card. It’s especially difficult to remove because of the Deathrattle effect. Zul'jin: Represents some truly bonkers value, even if the random targeting makes this axe-thrower a little risky. Hi folks, this is now updated for the current pre-Boomsday meta. We'll update it again once the expansion is out, of course. Any questions just ask in here and we'll be able to help you out. If you'd like a response from me, include @ Bedders (without the space) and I'll see the notification. We have dozens and dozens of guides to keep updated and that guarantees I'll see it if the article's not on the homepage. I beat Highlander Priest and Tempo Rogue with this deck. Some of the cards listed in the guide I either didn't have, or didn't help me. -Marin can give incredible value with the treasures. -Explosive Shot as a good clear for high health minions. -Rexxar is good against Priest and Shaman, and comes with a better Grievous Bite and minion creator. -Stitched Tracker can get you a good minion in hand for 3 mana. Remove firefly, replace with jeweled macaw- you still get a 2 for one pull any better synergy with your other beasts and buffs. The fireflies can't be buffed with other cards in this deck and end up as disappointing clutter. The Macaw seldom gives me anything useless. Remove one each of bittertide hydra and Savannah highmane in exchange for one tundra rhino and Deathstalker Rexxar: this way you have more versatility against priests and shamans. However, Do not use Rexxar if you can still use your 2 point shot. Further, having a good 5 drop that gives charge procs kindly grandmother well. Bearshark: great against priests, but I found replacing one of these with Vicious Fledgling to help a great deal. Tracking: I have awful luck with this card and end up losing 2 decent cards, so I traded for either Dire wolf, the 1 point or the 2 point, up to your personal preference. This creates great synergy with your other cards and is seldom wasted in late game. With these small changes I went from fail to winstreak. As for Unleash the Hounds, as I said, I'm not sold on it either. I don't know about subbing it out for Alpha though, he's really bad on an empty board especially for board control, even though he's really good on a full one. I think Spellbreaker is actually pretty good with all the Priest of the Feasts, Despicable Dreadlords, Spikeridged Steeds, and Bonemares running around- but I agree that two of him is pretty bad. I have the same issue with Alpha as before. Your list seems okay but a couple changes I'd recommend. 1) You have 2 stitched trackers AND 2 tracking. I would drop 1 of each, or keep 2 tracking and drop both stitched trackers. You could pick up a 2nd Golakka and a Bonemare. 2) Jeweled Mccaw. Switch them to firefly. Fire fly gives a stronger board presence and fills in those odd mana gaps that might occur. I use to run Mccaw as well but I lose board control too easy, especially against Rogue which is popular in the meta. 3) UtH. Personally I don't run this card but that's subject to change if zoo lock gets popular. It's often a dead card or over costed card. I'd replace it with alpha wolf. 4) Spell Breaker. A good tech choice, but I'm not sold on him. No beast synergy and can be overcosted in some matchups, especially priest. I'd replace with a 2nd alpha wolf. Your deck is better suited for a slower meta as it currently stands. I can't see it being competitive against rogues, shaman, and zoo locks. As hunter, you can't afford to lose board control (hence why fire fly is a solid choice). You need efficient minions. Deadly shot vs. Unleash the Hounds is such a hard choice... Unleash the hounds I feel is mindblowingly powerful /w Leokk, but man, against aggro, they run a lot of 2 health minions (fire fly, Living Mana, Bloodsail Corsair) that feel like they make it pretty weak. COntrol opponents just don't make a big enough board for it to matter. Deadly shot, however, is situationally useful (weak against aggro (usually) strong against control. Currently I run one of both. Any ideas for improvement on this from anyone? I don't have Patches, and I really want to keep Rexxar and probably tracking (tracking is so good... let's you adapt your strategy to whatever you want or need. It can be a bit sad to discard one-of cards in your deck, but sometimes the discard can actually clean out your deck a bit (getting rid of Macaws and Alleycats for you, or unnecessary late-game drops). Here's last week's version of the deck for comparison. I know some of you like to be able to reference the earlier stuff, so I'll keep doing this going forwards! I know this is a bit of a crossover from another article, but are you certain this deck is tier 4? Kibler has been doing well with it in pretty high legend- he runs a different list, but still. I guess I don't know for sure- considering crafting the deck anyway because the build-a-beast power is just so fun. @Xentro Ah, I did a little bit of tidying up first thing this morning and so it's possible I cleaned up whatever the problem was! Thanks for getting back to me though. @Bedders I think it's fixed now. The tier list article had secret, midrange and deathrattle hunter but the last two links sent me to deathrattle hunter. I found this one by searching for 'midrange hunter' on the site. @Xentro Hey thanks for letting me know. Can you be more specific about the KFT article with the broken link please - which one has the problem? Just wanted to note that if you follow the link from the KFT article to the midrange deck it links to the deathrattle deck instead of this one. I ran into this deck, but they were running Dinomancy. Really tough. If we were to use Dinomancy, what do you think would be best to remove? 100% worthless deck. Can't even get wins at lvl 18. Stampede is not showing the right card. Eaglethorn Bow isn't in the deck list but it is referred to as a mulligan. Im sorry, its not so bad. Its really an enjoying deck. @richardalbertpizarro Here's the previous deck list, although I think it's worth stressing that the same deck creator is responsible for both of them. It was better last month hunter mid range. And no traps to activate eaglehorn bow´s effect? @Klck This is Jab's deck list who I've long turned to for the best in Midrange Hunter developments. If you are swamped in aggro you might switch to Explosive Trap or make room for it at the expense of something else I guess, but this is the deck I've been laddering with - it's been happy days so far! This decklist seems to beg for at least one explosive trap. Im courius why you decided to use freezing trap. I played this a few times and found sir finley was great. You can get life tap (very useful) or a heal or ping. The hunter hero power is quite useless in most situations and I think another one will usually be better. Thanks for the guide. I have all of the cards except Huge Toad. Can anyone recommend a good replacement? Currently I have 2 x Dire Wolf Alpha's as substitute. My experience with this deck is that it lacks card draw and that the second deadly shot often lies dead in the hand. I'm going to replace deadly shot with ram wrangler or some other late game card, as I often find myself not having enough threats against control, or the late game I have is too slow against aggro. No N'Zoth in this version. Should probably remove the tip about him. Just wanted to ask how Dr. Boom is a counter to Big Game Hunter? 1. Why only 2 secrets with 2 mad scientists? I found myself in lots of situations where a scientist popped with no secret left. 2. Why the same secret twice? If you have one secret out and one mad scientist, if the mad scientist pops you don't get a free secret. 3. With the knife juggler synergy, don't forget the haunted creepers. Send a haunted creeper into a minion then get 2 points of damage with your two 1/1's. @TTelion Dr. Boom is arguably the most powerful card in the game tbh. Hopefully no one flames me, lol, but he is that good. Obviously there are a few that fit a little better here and there based on a deck build, but he is overall generally great in nearly any deck. That aside, Any of the other powerful legendaries are good substitutes I suppose. Just google "best HS legendaries" for any number of different lists. The top few of nearly any one of those lists will work. As far as non-legendary there's always some of the better rares such as Sludge Belcher, Sun Walker, etc. Although really you should focus on getting Dr. Boom ASAP. Good luck! What would be a good exchange for dr.boom in this deck (both legendary and non-legendary) ? I've been playing Midrange similar to this for the past few months as well. Standard Midrange Hunter is simply too weak in the early game against aggro. I think the slightly hybrid approach will be the new archetype. My midrange deck is a little faster, less beast/secret dependent and has anti aggro like belchers and healbot to be more geared toward the rank 10-18 ladder. Thanks for the great guide! I've been playing a lot of Midrange Hunter this season with great success. The deck I use is slightly different to this one, so its interesting to see this version. Just a couple of questions..
1. Why take out Houndmaster completely and replace it with another Piloted Shredder? Thanks for sharing this! I will definitely want to try it out!